creativespacesineducation | What can I do to foster creativity in my classroom? Given we are all unique and that creativity is powerfully subjective, it is important to explore what is beneficial to the individual. It is possible that one student’s creative behaviors will be entirely different to their peers. This exploration into the students’ personal “happy place” of creativity, if you will, will encourage students to be creative, providing a sense of comfort in a perhaps foreign place. It should be an open exploration that the class can engage in together, deciding how they will encourage each other to be creative, and how their creative behaviors are varied. This may lead to new concepts, activities and factors that can contribute to a creative environment that is specific to your students and classrooms. According to current research outlined in The Creative Formula, exposure to a wide variety of unrelated stimuli is beneficial when fostering creative thought (Imber, 2009). The late Steve Jobs is used as an example. The founder of arguably one of the most innovative companies in the world, Jobs studied what he thought were the most interesting subjects, rather than the most practical, including Calligraphy. It can be reasoned that providing a barrage of interesting unrelated material as a stimuli, excites the brain, encouraging divergent thinking and creativity. Imber suggests that individuals engage in activities that are completely new to them, including seeing films, cooking meals, attending public lectures or taking short courses. This could be directly translated to a classroom, where students could be introduced daily to interesting facts, websites, blogs, short films, stories. Students could be set tasks where it is their responsibility to source such interesting or novel material and share it with the class, replacing the traditional show-and-tell activities. Imber, A. (2009) The Creativity Formula: 50 Scientifically Proven Creativity Boosters for Work and for Life.Liminal Press: Caulfield, Australia. As mentioned on many occasions in this reflection time is one of my greatest enemies. Perhaps my time management skills are inadequate, perhaps I am too ambitious in my goal setting, or perhaps I overestimate my ability to multitask. Whatever the reason, I find myself constantly chasing the clock. This week in particular, despite rigorous planning and allocating time to engage in flow, I have found myself with less time than I had banked on. The lack of time, in my case, causes great anxiety. This leads to frustration and stress; fundamental barriers in creativity. Imber (2009) states that anxiety “causes us to narrow our attention so we can focus our efforts toward avoiding potential threat” (pg. 71), and is therefore detrimental to divergent thinking. Imber suggests that in order to properly engage with creative tasks, we need to allow our minds the time to incubate our ideas before effective lateral thinking can be achieved. Deadlines can’t be avoided in real world situations, and teachers unfortunately find themselves with less time for quality education experiences. However it is important to understand that creativity takes time, while there are things we can do to encourage our creative behavior, sometimes our time constraints can impinge on our abilities and our flow. Imber suggests that while deadlines may not be flexible, understanding why the exist may ease the frustration associated, and that careful (and flexible) planning may also assist with such factors. It is important to understand that students may feel similar anxieties about time constraints, particularly when trying to complete creative tasks, and we therefore must have support in place for such situations. Perhaps having somewhere students can retreat to for a few minutes to take a break (clear their head), or being frank with students about the reasons for the time restrictions. Tasks (creative tasks in particular) may need to be accessible outside the classroom – i.e. taking things home, having access to them online or them being available during break times. By making creative situations more flexible, students may be encouraged to engage in them, rather than creating an air of anxiety toward them. Another Ken Robinson video, while this one is very interesting in terms of how we should model our curriculum in the face of changing cultural and economic factors, I am more interested in the animation of this video and have drawn inspiration on this for my digital artefact. I have proposed to create a teaching tool demonstrating how we can foster creative thinking in our classrooms. I am now considering the use of a similar style or format of animation as this RSA Animate video, capitalising on my ability to draw, depicting visual examples of the techniques outlined in this reflection and in Imber’s The Creative Formula. Despite the controversy about the credibility of the TED people, this talk is quite excellent. Sir Ken Robinson delivers an entertaining spiel about current curriculum structure impinging on students’ creative behavior. Instead he believes we (as teachers) should be fostering this behavior in an everyday sense. Robinson anecdotes provide humorous inspiration for further investigation. Fr example, he mentions a girl who drew God. For those who are religiously inclined, no one really knows what God looks like, and therefore, drawing God (no matter your religion) would be a task exercising creative thought. This draws on the same concepts as Liu and Noppe’s (2009) “what if” scenarios outlined in previous posts. In both tasks, students are given an open, impossible or outlandish scenario: i.e. draw something that you have never seen. The participator has to use their imagination to creatively respond to a problem. Imber (2009) also outlines the importance of such a task when shifting from convergent to divergent thinking. She suggests that shifting between types of thinking may be difficult for some people and that many may need to “warm-up” before being capable of lateral thought. While teachers are restricted in time, something that has already been addressed in this reflection, Imber suggests that such a warm up would only take a few minutes and may not be the focus of the actual task. Imber’s example of the impossible task is called “Fat Chance” and is completed in groups. There are two key elements: 1) Give someone a scenario with a near impossible objective and 2) to include an incredibly tight time frame. Her example is to cure cancer by tomorrow. The success of this task is determined by its restriction on non-creative thinking: “The problem can only be solved through taking a leap and thinking creatively”. These kinds of games would be easily adapted in classroom environments and given their brevity, could be used between sessions to stimulate creative thinking. In keeping with the colour changes previously mentioned, I have opted for a colour scheme change with the appearance of the reflection. What used to be cool-colour-themed, now promotes creative thinking and innovation with warm colours. Colour can be important to encourage creativity within your environment. Imber (2009) states: “your physical surrounds have a huge impact on your creative thinking skills and innovation” (pg. 17) and that detailed experiments have lead to the conclusion that warm colours promote divergent thinking. Imber suggests shifting colour schemes in office or personal spaces where creativity is being promoted, i.e. opting for warm coloured furniture, walls, lights, or simply putting up posters with warm colour schemes. While classroom resources may provide limitations for what colour the walls or furniture may be, simple changes to the colour of stationary, the colours of posters or even the colours of work sheets and feedback could be adapted to opt for more warm colours. Students could be encouraged to bring a warm coloured piece of clothing to school as their creativity item. When presented with tasks that encourage them to use divergent thinking, they could adorn their item, engaging with the task physically, as well as promoting their creativity with being surrounded by warm colours. Imber, A. 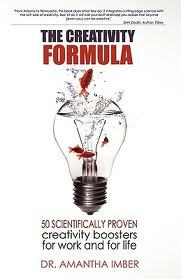 (2009) The Creativity Formula: 50 Scientifically Proven Creativity Boosters for Work and for Life. Liminal Press: Caulfield, Australia. Unlocking the Power of Possibility. As discussed previously in this reflection, a recent shift in testing has increased demands on teachers to focus more acutely on results in academia, rather than fundamental understandings in all areas of education. Liu and Noppe address these demands, outlining that a shift toward imagination and creativity will aid in the achievement of required results that schools are accountable for (2009). They also introduce the “What If” game (many adaptations exist, I’m sure) to practise creativity and use of imagination. By posing abstract scenarios, students are encouraged to use their imagination to describe how that scenario would manifest in their lives. They are practising their abilities to review-in-action. These games could be powerful in elasticising minds for creative thought and could be used in the classroom as warm-up activities. This could be particularly important to ease transitions between convergent and divergent thinking! Liu, E. & Noppe-Brandon, S. (2009). Imagination First: Unlocking the Power of Possibility (pp. 22-39). Hoboken, NK: Jossey-Bass. – If I am at home, no one else is. Before I sit down, I have to fold all the clothes on my floor and tidy my room. My desk sits in front of a window, which is left ajar. – If I am at uni, I sit in the library in a silent study area, as close to a window or natural light as possible. From these observations, you could either deduce that I am a recluse, incapable of separating social and academic life, or that I prefer a clean, quiet space to encourage flow and creative thought. I prefer to be indoors, away from the distraction of the immediate natural environment, however I have a propensity to the opportunity for natural surroundings (a window with a view). Perhaps it would be valuable for students to engage in their own personal discovery of their optimum environment? annalithgow on Show and Tell?